This World Environment Day, #DonateAPhoto, Empower a Story. Pratham Books has always believed in the role books play in connecting children to the world around them. From the Chipko movement to flamingoes, from seasonal eating to conservation heroes, over the years Pratham Books has published numerous books that bring the wonders of the natural world into the lives of young readers. Today is World Environment Day and this year’s theme is ‘Connecting People to nature – in the city and on the land, from the poles to the equator’. Words and images can play a powerful role in helping forge this connection between children and their surroundings. 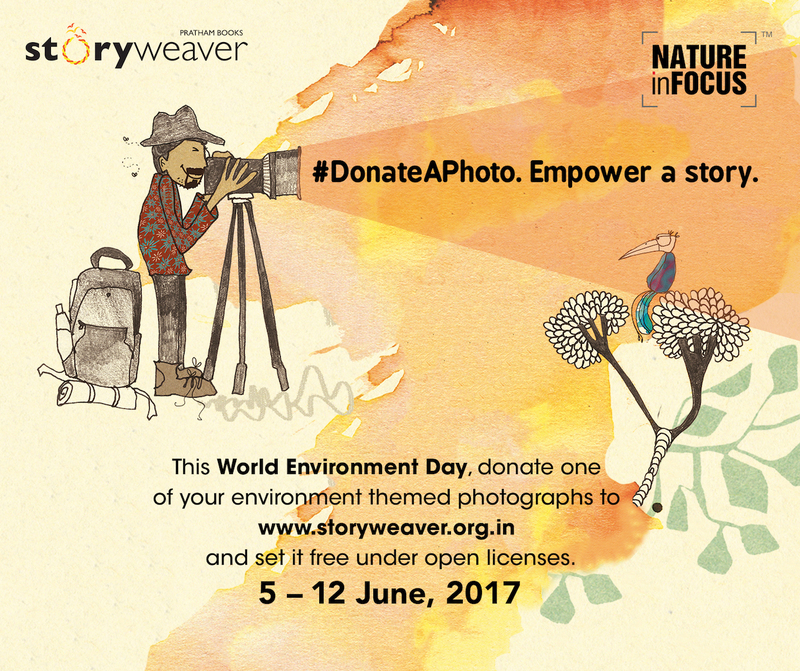 This World Environment Day, Pratham Books StoryWeaver is joining hands with the good folks at NatureinFocus to bring you #DonateAPhoto, Empower a Story: a campaign to crowdsource 100 environment-related photographs. These photographs will be uploaded to StoryWeaver, and join over 6,000 other openly licensed illustrations on the platform. Through the #DonateAPhoto campaign, we hope to add to the diversity of our image bank, and offer our community of users, stunning photographs with which they can create multilingual stories, flashcards and more. Select an environment related photograph YOU have taken. It could be flora, fauna… anything. If you have a StoryWeaver account already, click here, scroll to the bottom of the page and click on 'Upload your own illustration/image' to upload your image. If you don’t have a StoryWeaver account, click here to create one. It won’t take more than a minute. Fill out the form and upload your images. Remember to read the note on CCBY 4.0 if you're unfamiliar with the license. Add tags to describe your image, so that people can find it easily on the repository. For. eg if you’re sharing an image of a barn owl use tags like ‘owl’, ‘barn owl’, ‘birds’. Don’t forget to add the tag DonateAPhoto too! Sit back and feel super happy that you’ve contributed to our image bank. Go back to step 1 to repeat, or tag your friends on social media to join in too! All images uploaded must be taken by you. Photographs uploaded must should be a minimum of 300 dpi and the file size should not be exceeded 2 MB.